An exciting application for this technology is hydrogen powered fuel cells in the automotive industry. Hydrogen powered cars enjoy a longer range and lack the long recharge times of their battery powered counterparts. South Korea has become an incubator for hydrogen powered cars with government sponsored initiatives in research and infrastructure, and with Hyundai commencing manufacturing on its hydrogen powered Tucson crossover at their Ulsan, South Korea plant in 2015. Mydax is taking an active role in this emerging market by providing a cooling solution for hydrogen refueling stations. One of the challenges faced when pumping compressed, pure hydrogen into a vessel onboard an automobile is cooling the hydrogen to temperatures cold enough to attain the proper working pressure. The capabilities of the Mydax CryoDax60 chiller, the largest of Mydax’s new CryoDax line of chillers, aligned perfectly with these requirements and specifications. Utilizing two 30 horsepower compressors in a parallel configuration, the CryoDax60 is able to cool a recirculating loop of silicone oil down to -60°C, while providing 22.7 kW of cooling at -40°C. Like all Mydax chillers, CryoDax chiller systems incorporate fully welded, powder coated steel frames for durability, as well as stainless steel reservoirs and brazed plate heat exchangers for leak free performance. 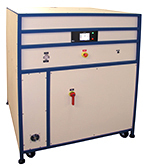 Reliable operation is also ensured with prejudice component selection and rigorous testing procedures. Standard features also include the Opdax Controller which utilizes a high resolution 5.7” color touchscreen display for ease of use by the operator. 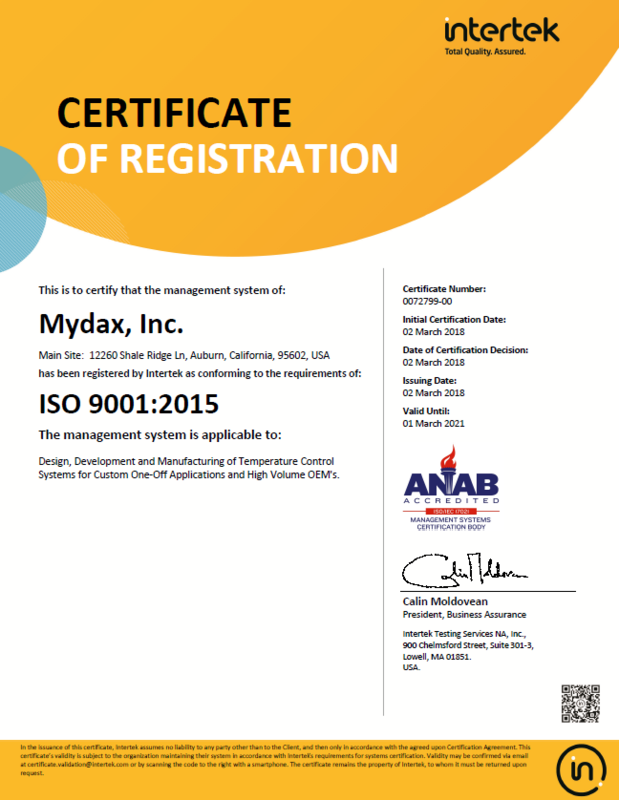 In order to serve customers in Europe, Mydax’s CryoDax chiller systems are also manufactured in compliance with European Safety Directives with CE marking available. For more information on Mydax CryoDax chillers or any other custom cooling solution, visit www.mydax.com or call +1-530-888-6662.